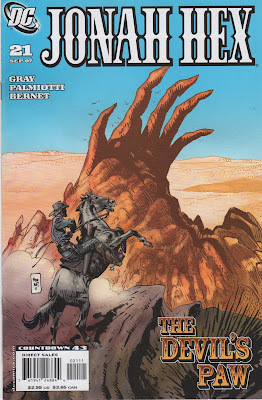 Jonah Hex V2 #21 "Devil's Paw"
Jimmy Palmiotti and Justin Gray - story, Jordi Bernet - art and cover. Red Mesa, territory/state unknown. A stagecoach rolls into town and three women on their way to Plimpton, disembark from the stage and inquire at the saloon as to where they could find dinner. This being a book written by J & J, the women and repeatedly raped in a two page montage. Next we find ourselves in Plimpton (three days ride from Devil's Paw). Fella by the name of Montana and his gang are in the process of robbing the bank when about ten Pinkerton's get the drop on them and the shootout finds Montana's gang stuck in the bank. Montana jumps out a window, runs towards his horse and grabs up some saddlebags full of dynamite and dashes back into the bank. He then crawls out through an exit on the roof and leads a couple of Pinkerton's to the General Store where he blows them up with dynamite. Finally Montana and his men make a break for it as the bulk of the town catches fire and burns. Jonah Hex is being hired to bring in Montana and his gang. They have robbed fifteen banks in the past few months and Mr. Jones is wanting payback for the death of his men. Jonah assures Jones that he will do his best. Montana and his men are crossing the desert, tailed relentlessly by a man who gives them no rest for the past three days (it is, of course, Hex). Montana decides to hole up in a nearby rock formation and set an ambush. The rock formation, the Devil's Paw, looks like a massive hand reaching up out of the earth. As Hex rides closer, we can see several types of writings and pictoglyphs on the walls, placed there by generations of Indians. Night falls and Montana and his men have built a fire. A couple of the men are getting jumpy but Montana says they shouldn't worry about Indians, they have been moved off to the reservations. As they get ready to bed down, a shadow darts past them and appears by their horses, a lone Indian with a knife and a crazed look in his eye. The men panic and open fire, killing all of their own horses. Jonah hears the shooting and more commotion. As he closes in on the camp, he comes across one robber, dead and scalped. Jonah moves in closer to where another robber is being scalped alive as Montana tries to take a shot at the Indian. Montana misses and flees, running straight into Hex. Hex and Montana stand there, guns pointed at one another, the Indian silhouetted against the rising moon, bloody scalps in his hand. 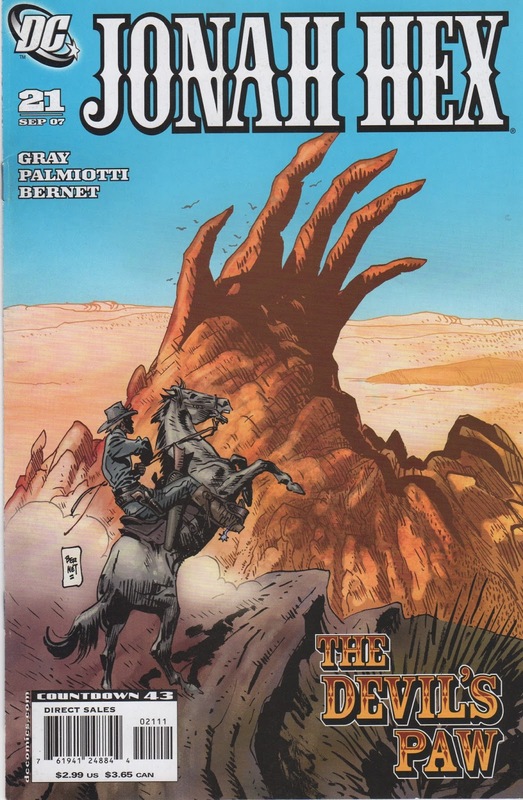 Montana tells Jonah that Hex has bigger worries and Jonah shoots him dead. Then, as the Indian looks on, Jonah pulls out his knife and scalps Montana himself and tosses the scalp on the ground. He drags Montana's body out of the rock formation, hoists it across his saddle and heads out. Jonah rides into the town of Red Mesa and walks into the saloon. He sees the dead women and stage drivers on the floor. He pours whiskey on one of the men sleeping amongst the carnage, asks if they had fun with the women and then kicks the man's teeth in. Shortly, the saloon is ablaze with Jonah standing in the street. As the men inside awaken, they run out and Hex guns the first one down. Others, without their guns, have the choice to burn or run. Each of them run for it and each one dies as Jonah picks them off. Men Killed by Jonah - Well, Montana and a bunch of guys at the saloon. Uh.... 10? Timeline - No way to put a date on this one, no reference to anything else. It does cover quite a few days in travel. This one was pretty lame no matter how you cut it. 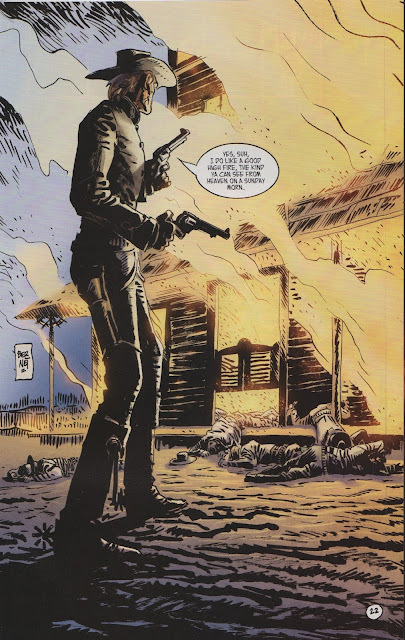 The useless rapes in Red Mesa were nothing but a device for Jonah to gun down a bunch of guys, the Indian living in Devil's Paw served no purpose, and how Montana and his gang got out of Plimpton wasn't really very clear either. This was probably the worst issue of the series so far, but there are worse ones coming, believe me. Next Issue: Tesla! Edison! Electricity! and the darkest murkiest artwork you ever did see!